Before we left for the spring training trip Mik said he was not going to get any mini bats unless they were of the parks or really cool. 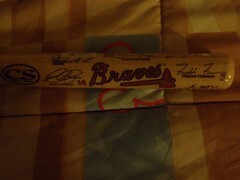 Apparently, this one with the signatures of several Braves players was a design he thought qualified as really cool as he just had to have it when he saw it. It is actually a 2012 Braves mini bat design and his reasoning for getting it was that it has Chipper Jones on it, which is sort of special with him now retired.